All dog owners will tell you about the joys of having a pet. And although it is hard not to feel happy when playing fetch with a puppy – aside from the immediate pleasure that they bring, do dogs actually help reduce depression? Feelings of anxiety, stress, and depression arise when we internalize negativity. As adults, we seek approval from friends, family, and other members of society, and in turn, allow our self-worth to be determined by the judgment of others. By doing this, we personalize negative situations that we cannot control and forget that the real source of our worth comes from within. Dogs have evolved to be highly in tune with the behaviors and emotions of humans, and provide us with unconditional love. It is because of this judgment-free love, that their invaluable companionship offers us some serious mental health benefits. Below is a roundup of 6 of the ways that dogs help us fight depression. Dogs offer us unconditional acceptance. As long as they are fed and well-taken care of, dogs are without opinions or judgments. They don’t care if you said something silly, or didn’t shower – they will love you unconditionally. Dogs provide their owners with a safe space to divulge their innermost thoughts and fears. Having a pet as a silent sounding board for your thoughts gives you much needed moments of self-reflection away from the judgment of others, and reminds you that instead of seeking approval from others you should only seek validation from within. Exercise is a rewarding personal activity that encourages self-reflection and self-validation. Additionally, fresh air and a change of scenery often help boost our mood and ease symptoms of depression. Dog owners are more likely to go for walks, hikes, or runs with their pets – allowing them ample opportunity to renew themselves from within. Dogs reduce isolation and loneliness. The world is constantly changing, and is filled with random and impersonal events. As a result, it is important for us to recognize that we cannot control or personalize every bad situation that happens, and that we cannot rely on others to determine our value. However, knowing that, isolation and loneliness can still trigger depression, and it’s important to understand our value without retreating from social and cultural institutions. Caring for a dog makes people feel valuable and wanted. The unconditional companionship of a dog helps reduce stress and prevent illness. Additionally, dog-related activities create a comfortable space for new hobbies and friendships to develop. Dogs help us manage our feelings. Dogs can read our behaviors and can sense when we are in a negative emotional state. Not only do dogs comfort us when we’re feeling anxious, stressed, or upset, they also change their own behaviors to mimic ours. 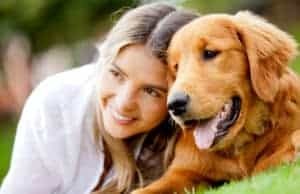 Dogs respond best to calm, assertive, and positive behavior – and as owners begin to recognize the influence that they have over their dogs, they become more self-aware and make more concerted efforts to cope with challenges in positive and productive ways. The healing power of touch is undeniable. Touch lowers blood pressure, decreases levels of stress hormones in our body, and lowers our heart rate. When a dog owner is feeling anxious, stroking their pet will help calm their nerves and prevent their anxiety from becoming a gateway to depression. Dogs don’t worry about what happened yesterday or what will happen tomorrow – they live fully in the moment. Humans often dwell on negativity and relieve negative situations. Living with a dog can help owners gain a greater appreciation for the present, and worry less about the things that they cannot control.